When I edit landscapes, I always follow a specific structure in my processing workflow. I always start by evaluating the exposure. If I see it needs correction, I use the exposure slider to make the necessary adjustments. In most cases when we shoot landscapes, the dynamic range of the scene is extreme, which means that the sky is too bright and the foreground shadows are too dark. This is when the second step of my editing workflow comes into play. I decrease the dynamic range of the scene by making the highlights darker and the shadows brighter. Next, I move to the contrast adjustment to ensure that the image is using the full tonal range. Color correction is the next step. I use the global adjustments to boost the saturation and vibrance. Then, I move to the individual colors and selectively adjust the hue, saturation and brightness. When I am done with the color correction, I apply sharpening to the entire image while simultaneously watching to make sure that I do not introduce extra noise. The last step of my editing workflow is to reduce noise without affecting the details of the image. 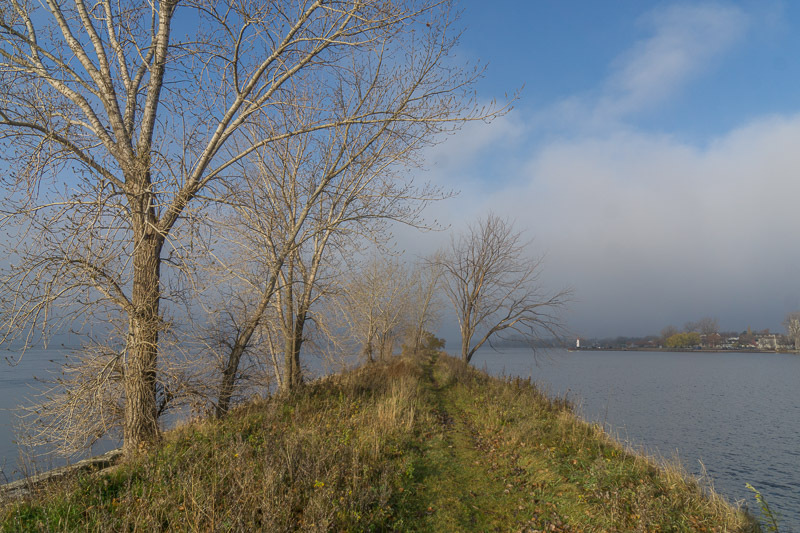 An optional step is to add vignetting to the image. As you can see, this is a structured multi-step landscape editing workflow. If you use Lightroom Rapid Editing, all the steps listed above are incorporated in every Lightroom Preset, which means that you do not have to worry about the complexity of the process. But, if you want to learn freestyle Lightroom editing with the goal of creating your own landscape editing presets, I want to show you the most important and critical part of the editing process. The 5 Second Landscape Editing process is only four adjustments that take around five seconds, at most, to apply. 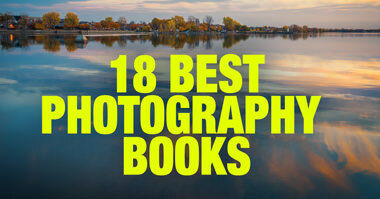 By performing these simple edits, you can drastically improve any landscape photo. Trust me! 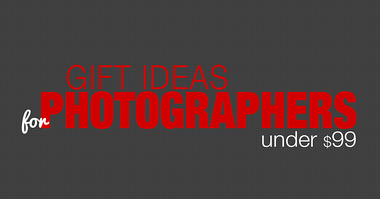 I use these simple adjustments on 99% of the landscape images I edit and you should too! For the demonstration I selected the photo I tool at Saint Lawrence River in the morning when the fog was not completely burnt by the rising sun. The photo is “flat” with no colors or contrast. and it is a perfect for “5 second editing” demonstration. Decrease the dynamic range of the image by dragging the Highlights Slider all the way to the left (-100). At the same time, drag the Shadows Slider to the maximum value of +100. In simple terms, we first recovered the highlights and then the shadows. To make sure the image uses the full tonal range from pure blacks to pure whites, we set the white and black points. This is a fully automated process. First, hold down the SHIFT key and double click the WHITES label next to the slider. 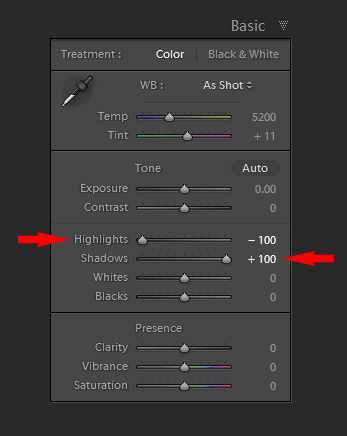 Lightroom will set the maximum value for whites automatically without clipping it (in other words, without introducing pure whites). Next, hold down the SHIFT key and double click the BLACKS label. The BLACK value will be set to the maximum value without clipping it (in other words, without introducing pure blacks). As you can see, the improvement is substantial and took us all of five seconds, at most. If you use freestyle Lightroom editing, I suggest starting your landscape editing workflow with this simple technique. It will serve as an excellent starting point for any further editing. Viktor: Thank you for the lesson! 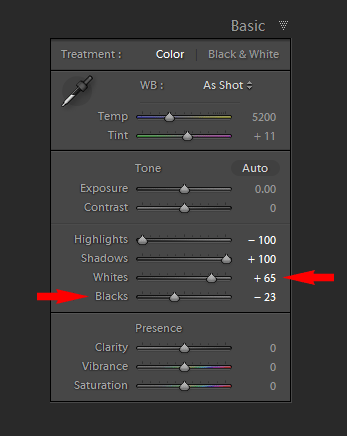 I never knew about the 2x clicking to automate setting whites and blacks. Can’t wait to try it. Cheers, Rick. Thanks for the tips, it works great and very fast. Wow this is fantastic. I am very much enjoying your instruction.